CamTwist fully supports up to three Blackmagic Design Intensity Pro capture cards in a single MacPro system. You can even mix and match input formats, resolution and signal format from card to card. Intensity cards support a plethora of inputs from Component, Composite, Y/C (S-Video) and HDMI. Need higher end inputs? 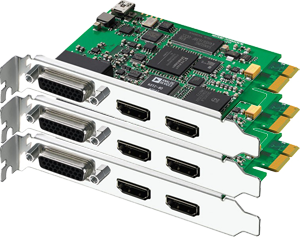 Blackmagic also sells Decklink cards which add support for SDI, HD-SDI and dual link HD-SDI. Some cards even have more than one active input allowing you to get up to 6 cameras/inputs on a single MacPro. Have a laptop and need HD inputs on the go? If you have CamTwist and FinalCut pro installed a firewire enabled DVCPRO HD Camera can be used natively without any capture cards. Simply put your DVCPRO HD camera in to 720p/60 mode, plug in the Firewire and off you go! Other mobile capture devices such as the AJA IO or Matrox Max should work as well, so long as QuickTime can see your device, CamTwist can see it too!